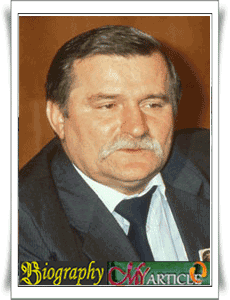 Lech Walesa was born on September 29, 1943 in Popowo, Poland. After completing his education at the vocational school, he worked as a car mechanic in 1961-1965. He decided to join the army for 2 years. In 1967, he was hired as an electrician on the ship belonging to the Gdansk shipyards. In 1969 he married Danuta Golos and had 8 children. In December 1978, there was a clash between workers and the Government. And he was one of the leaders of the workers. Because of that, he was briefly detained by the Government. In 1978, he became a servant of the store. Since taking the job, as a result, he was fired from the ship. After that, he started to become activists and became head of the Union. He was often arrested by security services due to partake in the action on the beach. In 1980 he began to lead the workers at the Gdansk shipyard to mogok. The main demands were the right workers. Finally, on August 31, agreement describes the rights of workers to organize independent unions of their own. In 1981, he was elected as the Chairman of Solidarity (Solidarity Chairman) in First National Solidarity Congress in Gdansk. In April 1990 in Solidarity's second national congress (the second National Congress of solidarity), Walesa was elected Chairman with 77.5% of the vote. In the election in December 1990, he was elected President of the Republic of Poland. He served until being defeated in the elections of November 1995. Walesa himself has received many honorary degrees from universities, including Harvard University and the University of Paris. Other honors included the Medal of Freedom (Philadelphia, USA); Free World Award (Norway), and the European Human Rights Prize.